There are few things SYB enjoys more than assisting tourists: hardly a week goes by without his proactively offering directions to bewildered-looking foreigners. German speakers, in particular, will capture his attention… as will fetching French women, as was the case with RM’s guests, whom we met at his St. Patrick’s Day soirée in Sunnyside. MB and JA were in town for just over a week, and fortunate I think to have such attentive and enthusiastic boosters for New York City at their disposal. I crossed paths with the touring trio on Sixth Avenue, as they were heading into the MoMA to take advantage of Target Free Friday Nights when museum admission is complimentary from 4–8PM. All other times, it’s a rather steep $20, which explains this insane queue for entry. 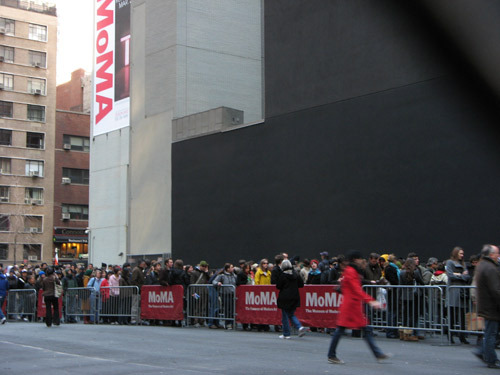 So despite the fact that my MoMA membership card would earn me line-jumping privileges, I knew that every single one of these people would make it inside the museum eventually, and I didn’t particularly want to be there when they did. Not when I could check out the acclaimed “Design and the Elastic Mind” exhibit any other time… through May 12, anyway. I met up with SYB, MB and JA a couple of hours later at Amazing 66, where we gave our visitors an authentic taste of Chinatown. Tonight’s menu overlapped much of the Mardi Gras meal -– with the short rib-stuffed pumpkin and steamed whole flounder the unqualified hits of the night — but in the excitement of feasting, I neglected to order the “Salad Walnut Prawns” — sorry, HYB! Afterwards, the nine of us made the obligatory post-dinner visit to the Chinatown Ice Cream Factory around the corner. After the couples took their leave, it was up to the B brothers and me to plan out the rest of our evening. The night was still young, but, as it turned out, so were our guests; JA was a couple weeks shy of her 21st birthday, which strictly limited our options. Three native New Yorkers, and not one of us could immediately think of a place to spend a Friday night that did not involve drinking, or that at least required guests to be of drinking age. Embarrassing, actually – and a testament to how very long it had been since any of us had to take such matters into consideration. I remembered what fun we’d had at J’s birthday celebration in December, and suggested Fat Cat Billiards on Christopher, both for its live music and its low-key vibe. Under 21 welcome! The $3 cover got us into the basement saloon, stocked with pool and ping pong tables, shufflepuck and foosball (“baby-foot” in France, I learned), chess and board games galore. 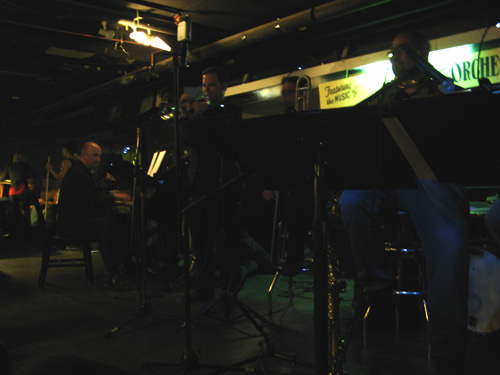 The women, though, seemed most entranced by the live performances, and the well-over-21 among us were more than happy to settle into the worn couches for the next couple of hours to catch the sets by The Gospel Queens of Brooklyn and one very talented jazz octet. 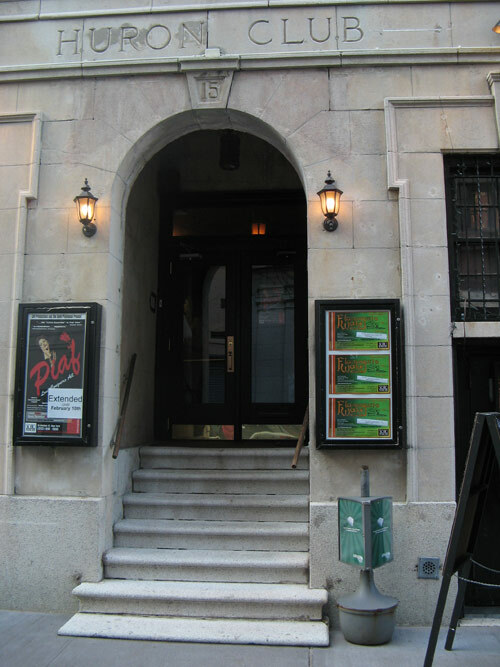 At the SoHo Playhouse this afternoon for Piaf: Love Conquers All, LVR Productions‘ one-woman show on the life of Édith Piaf, which began its Off-Broadway run on December 8. The show had been set to play downtown through late January, but due to popular demand, its run was extended by three weeks through February 10. Check out a commercial for show here. As dusk approached, the sidewalks began emptying of people as everyone gathered around the communal televisions for Super Bowl XLII. By now, we all know how that turned out, no? And after our underdog Giants quarterback hit receiver Plaxico Burress for the winning touchdown with 35 seconds left in the game, following that incredible, fortune-changing Hail Manning… well, for an otherwise “miserable city,” there was an outpouring of joy in the streets. One of the venues CL, CSF and I had considered for dinner tonight was the brand new Bar Boulud, but we decided in the end in favor of the more established Extra Virgin. None of us had been yet to this “little gem of a restaurant,” so to borrow a phrase from NBC’s 1990s summer reruns campaign, it was new to us. Bar Boulud’s menu looks interesting, though — charcuterie and cheese, terrines and pâtés — so I hope to make it over there one evening soon. 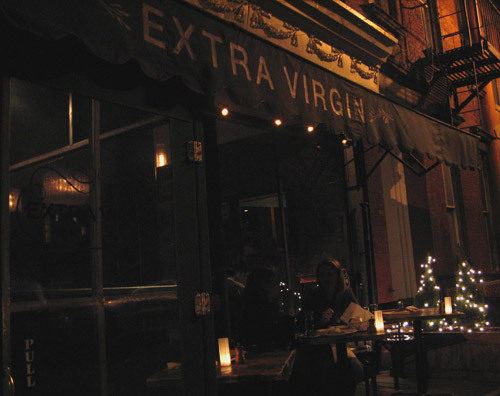 Executive chef and co-owner Joey Fortunato (formerly of Layla, Scarabee, and the Tonic), together with partner Michele Gaton (former general manager of The Coffee Shop), opened Extra Virgin in the old Titou space in 2004. 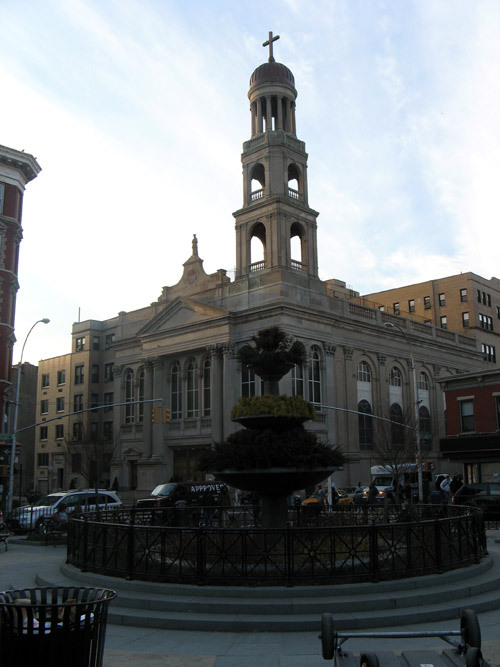 Their Mediterranean bistro proved so popular with West Village locals and destination diners alike that it expanded into the store next door in 2005, adding an extra 30 seats to the dining room. Three years later, the restaurant still draws crowds every night, and knowing its reservations policy — none for parties smaller than 6 — we planned an early arrival, and managed to score one of the tightly packed wooden tables with hardly a wait. 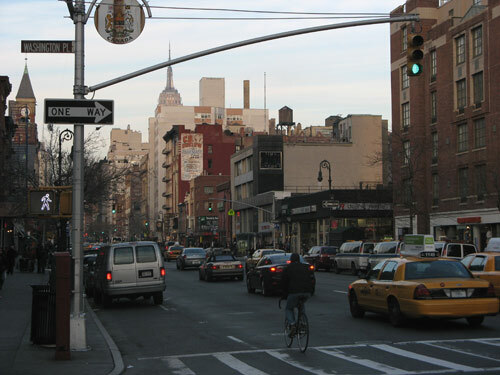 It was a case of good timing: by the time our food arrived, the dinner rush had set in, with patrons packing the long bar area and spilling onto West 4th Street. 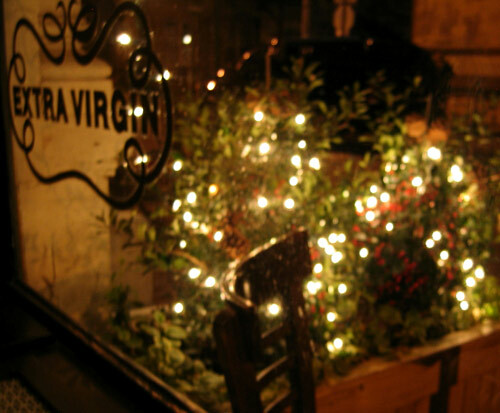 Extra Virgin offers the option of a few sidewalk tables: highly coveted in warmer months, but seemingly utilized even on chilly evenings like this one, by the intrepid (or impatient) few. Under a faux burl wood panel — which CSF remarked, reminded him of his parents’ basement — we dipped our crusty bread slices into a plate of excellent olive oil: extra virgin, no doubt. The warmly appointed room was a charming mix of soothing blues, exposed brick walls, pressed tin ceilings, and oversize, gold-framed mirrors. Flickering candlelight makes for pretty dining companions, but not for good food photography. Really, though, this evening was more about catching up with old friends than about lingering over food. (The anxiously hovering servers made the latter nearly impossible, anyway.) We paid our tab, and set off into the night.